If we are able to achieve our 2018 goals it will be a very exciting year for the Financial Pilgrimage household. Our goals range from personal to professional, with an emphasis on getting the remaining balance on our mortgage paid down ($31,000 remaining as of December 31, 2017). I’ll save the lecture on the importance of goal setting for another day. If you’re interested in my thoughts, you can read the recap of our 2017 goals. Now let’s jump right into our list of goals. This is the big one. We’ve been paying down debt since 2011 and it’s surreal to think that we should be able to pay off our mortgage in the next few months. All of our extra money is going towards the mortgage at this point. By minimizing lifestyle inflation and paying down all other debt, we have been able to make a huge dent in our mortgage that started out at $123,000. We moved into our personal residence back in 2008. Since moving in we have replaced the roof, HVAC, gutted and refinished two bathrooms, updated three bedrooms, replaced the hot water heater, partially updated the basement, and more. What we haven’t done is update the kitchen. I’m not going to lie, our kitchen is ugly and still has cabinets and counter-tops from the 70s. Our first large purchase after paying off the mortgage will including making much needed improvements to our kitchen. Each of the past three years we have slowly increased our charitable contributions. Our goal for this year is to give 10 percent of take home pay away once the mortgage is paid. I am excited about being able to give more and hope that our contributions continue to increase each year going forward. This is another “after we pay off the mortgage” goal. I currently contribute to my 401(k) up to my company match (6 percent). Once the mortgage payment is gone the goal will be to max 401(k) contributions. Through mid-February I am on book number four. Something I need to get better at this year is moving on from books that I’m not really in to. Some months I’ll read four or five books, and then others I don’t read any. I will occasionally get started on a book and lose interest and will be too stubborn to move onto something else. I mostly read non-fiction books on personal finance, business, and real estate. However, I will drop everything if George RR Martin finally gets around to releasing Winds of Winter! Blogging about personal finance has been really enjoyable. My commitment from the onset was to blog for one year, then re-evaluate if I still would like to continue. Life is too busy to write several blog posts per week, and I have found that producing one post every 10 days is about the right pace for me. I would rather publish posts that I believe are quality instead of pushing out sub-optimal content. This one will be challenging. I started a new job this year that came with a promotion. The new role is challenging, which is a good thing. However, I wonder if I’ll be at work enough to be able to get really good at it. I work for a rare organization that provides six weeks of parental leave, so I will be out of office for a good portion of the year. Not that this should factor into my review, though if I’m not around to really learn the new job it may not be easy to get strong marks at year end. The reason for starting this blog was to share my story and influence others to think differently about money. I would like to have a similar impact in my community. My wife and I are currently taking Dave Ramsey’s Financial Peace University. In the future I hope to either lead a class myself or get involved in related opportunities such as financial counseling. For the past 15 years I have played on an amateur men’s baseball team. The team primarily consists of current and ex-college baseball players. I started managing the team last year and still play occasionally even though I’m the old guy on the team. I find that sports are a great counterbalance to having an office job. Having a competitive outlet is important. Anyone who has ever run a sports team knows the amount of time and effort that goes into it. If I’m going to put the time into it, I want to win! This is by far the biggest stretch goal on the list. The reality is after paying off the mortgage, maxing out the 401(k), increasing charitable donations, and fixing up the house, there probably won’t be enough money to go around for this goal. However, I like setting lofty goals and wanted to add it to the list. This will probably be at the top of the list of goals again in 2019. A couple years ago I was at my parent’s house and stumbled upon an electric guitar in their basement that belonged to my little brother. I grabbed the guitar and ended up picking up a copy of Rocksmith for PlayStation 4. Rocksmith is like Guitar Hero, except you play with a real guitar. Apparently many people have learned to play guitar this way. While I would like to learn to play the guitar, I’m just not sure the time will be there to put in the hours of practice to get good. Maybe this will make the list once I retire from managing the baseball team! Many of these goals hinge on getting our mortgage paid off this year. If we are able to get the mortgage paid off by the summer, I’m really hoping we can jump right into getting our house fixed up. Then, who knows, maybe we’ll get lucky and find a real estate deal either as a live-in flip or rental property. On top of this all, 2018 should be life changing as we expect to welcome baby number two into our family mid-March. 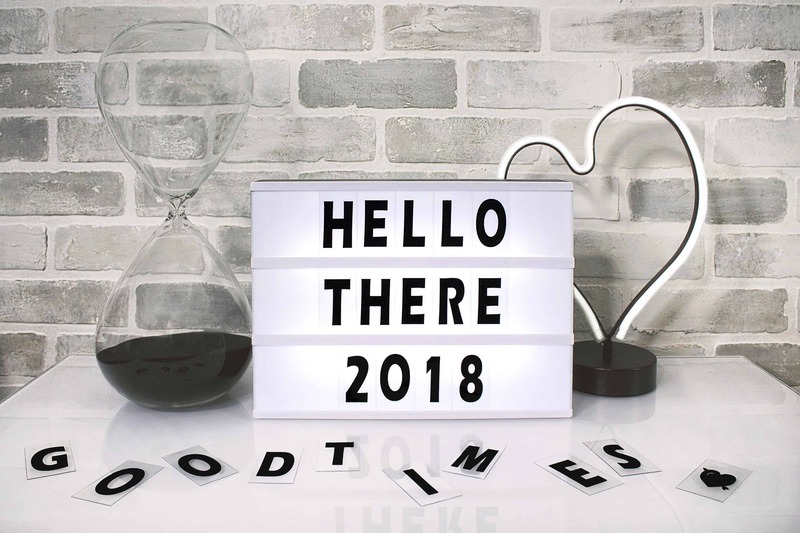 Cheers to a great 2018! Previous Who Are You to Give Personal Finance Advice? You are so close to that mortgage payoff!! That is seriously exciting news. And I love that the goal that follows is about ALSO making sure to share that money and up your charitable donations to go with it. I’m not at 10% yet either, but that number grows each year. Thank you! We’ve been paying down the mortgage so long I don’t know what we’re going to do when it actually happens. On giving, one thing we’re going to do is put a percentage or two aside each month for fun giving. Leaving a big restaurant tip, paying for someone’s groceries, donating to a go gofundme page, etc. It should be fun! I agree. It is one of several motivators for wanting my family to stay out of debt until we buy a house. Even then we want to pay it off in less than 15-years. We don’t do 10% either but like you guys inch it up every year. These are all wonderful goals. I am enjoying hearing about your family’s progress and values. You guys are great. I liked your list. I should make one of my own as well. $31,000 – can’t wait for me to get to that number on our mortgage! Thanks! It has been a long journey to get to $31,000. We’re so close yet so far away. I definitely recommend getting goals down on paper. It’s has been a game changer for us. What an awesome list of goals. I should take a lead out of your book and target debt repayment like you do. I like that you’ve also thrown in a couple of stretch goals. Like you, I’ve got a (bass) guitar that I want to learn to play. Do you know if Rocksmith has a bass option? It would be awesome to gamify my learning. Thank you! I do believe that bass guitar is an option in Rocksmith. Now it’s probably debatable if Rocksmith is the best way to learn guitar. However, it is fun! I like these goals a lot. They are very well balanced and if achieved, or even half achieved, you will leave 2018 on much better footing than you entered. Best of luck on your baseball championship goal. By the way, do you have a link to an article where you describe your mortgage payback strategy? Our strategy has been relatively straight forward. The one thing we’ve done really well is minimize lifestyle inflation. By doing so, we’ve been able to snowball more money towards the mortgage after paying off student loans, cars, and other debt. When we’ve been fortunate to receive raises at work, we have put the majority of it towards debt instead of increasing our lifestyle or buying more stuff.